Water law is in the news with the famous “Hirst” decision being used to blockade the state capital budget. To understand how this roaring mouse could hold up a billion-dollar budget, several myths need dispelling. The bottom line is that proliferating wells are harming Washington’s public resources, especially aquatic habitat. First, a quick explanation of water law. Under state law, every drop of water belongs to the state, unless owned by the Tribes. To use water you must obtain a permit, called a water right, from the Department of Ecology. The major exception is for permit-exempt wells, i.e., wells that supply rural homes and businesses. The exception states that parties may use 5000 gallons per day of groundwater for household or commercial use, plus water for a half-acre of lawn or garden, plus water for livestock. Based on this exception, hundreds of thousands of so-called “permit-exempt” wells have been drilled around the state. The Department of Ecology documented the increasing number of wells between 1970 and 2010 in an eye-popping set of maps. Myth No. 1 is that permit exempt wells use only 1% of the total water use in Washington, and therefore cannot harm streams. In fact, it doesn’t matter what total statewide usage is. What does matter is the number of wells in smaller watersheds and their impact on local streams – especially when those streams provide nursery habitat for salmon. Myth No. 2 is that we know how large the problem is. In fact, we have no idea how much water is used by these hundreds of thousands of unpermitted wells because, unlike city water systems, private well owners are not required to collect or report their usage. And that usage can be very large. For example, in 2011, the Washington Supreme Court ruled that permit-exempt wells may use unlimited quantities of water for livestock, including large feedlots. At issue in that case was a cattle feedlot that was using 600,000 gallons per day. To suggest that permit-exempt wells involve only small quantities of water and have no impact is wrong. And because there is no permit up front, no metering, and no enforcement after the fact, permit-exempt well owners can use enormous quantities of water, and no one is the wiser. Myth No. 3 is that pumping groundwater doesn’t impact streams. In fact, virtually all groundwater is connected to surface water. Private wells tend to be shallow, because the deeper you drill, the more it costs. Shallow groundwater is usually connected to the nearby stream, and when you pump a permit-exempt well, the water shows up missing in that stream. Denying this is like denying the existence of gravity. Myth No. 4 is that the Hirst decision is disproportionately harming rural development. The truth is that no one – rural, urban, agricultural or industrial – can get a new water right unless they offer mitigation to prevent impacts to the environment and pre-existing water users. Hirst levels the playing field, putting permit-exempt wells on the same footing as all other water rights: water for water mitigation is now the prevailing rule. Myth No. 5 is that streams don’t need high water flows. The fact is that a good year for water, with adequate snowpack and rain to keep rivers flowing in summer months, creates a good year for fish. Regrettably, that doesn’t happen very often, especially with climate change. We must protect high flows in our rivers and streams when they do occur, so that species other than humans can survive and thrive. The Hirst decision brings Washington water management into the 21st century. Rather than tear it down, the State Legislature should use this opportunity to fix problems such as unlimited water use for animal feedlots and lack of regulations to protect flows in all of Washington’s rivers. Categories: Exempt Wells, Instream Flows, Land Use, Legislature, Salmon, Uncategorized, Western Water Law | Permalink. Haboob: An intense dust storm carried across the landscape on an atmospheric gravity current. Common in arid landscapes such as the Sahara Desert in North Africa, central Australia, and the southwestern United States. Tri-Cities Dust Storm, Sept. 15, 2013. Photo taken by Bill Cartwright and published on KAPP-KVEW Local News Website. The Columbia Watershed. 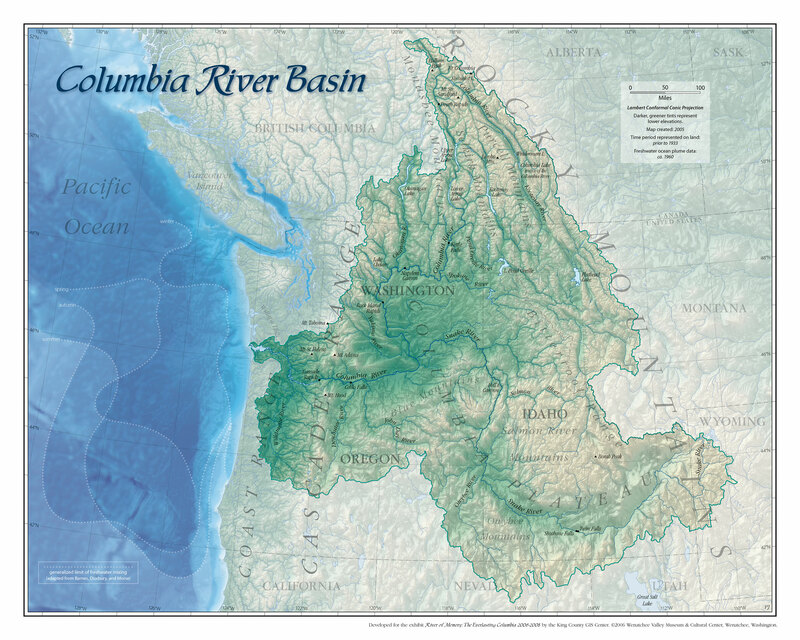 Map developed by King County GIS for William Layman’s “River of Memory: The Everlasting Columbia, 2006-2008”. Copyright held by Wenatchee Valley Museum & Cultural Center. Lots of people are meeting and talking about Columbia River watershed issues. Pick your event! TODAY, Columbia River, somewhere near Hanford Reach. The Voyages of Rediscovery crew are paddling two hand-carved dugout canoes up the Columbia River, 1,240 miles from the Pacific Ocean to Canal Flats, B.C. Their goal is to bring attention to the lack of fish passage into the upper watershed (including in Spokane and British Columbia). Follow their journey on Facebook. August 27 and more, on the web. The River Mile is a wonderful network of educators, students, scientists, resource managers and environmental educators sharing what they know and learn about the Columbia River Watershed. Teachers – get connected through several upcoming training webinars. September 26, Seattle. The American Water Resources Association, Washington chapter will hold its annual conference, “Future Directions in Water Resource Management” at the Mountaineers Center. This blog’s author will present on Columbia Basin issues. September 28-30, Wandermere, British Columbia. The Canadian Columbia River Inter-Tribal Fish Commission hosts the 2nd Annual Columbia Salmon Festival at Wandermere and Fairmont, B.C. (in the headwaters) followed by a two-day conference inviting you to “Think Like a Watershed.” The salmon are being called home. November 19-20, Spokane. 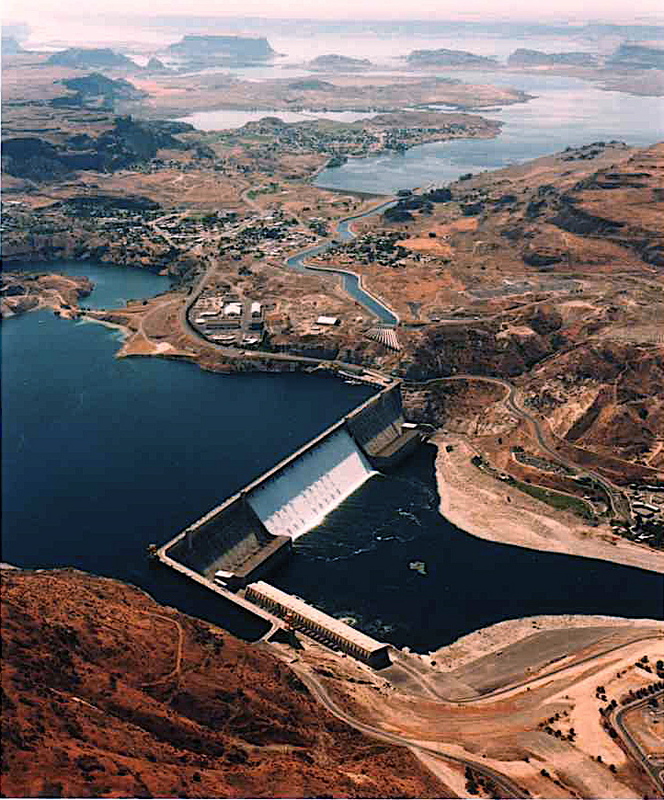 The bi-annual Lake Roosevelt Forum conference will cover multiple topics relating to Columbia River environmental issues. Spring 2014, Spokane. “Ethics, Water, & the Columbia River Treaty: The Columbia River Pastoral Letter and Creating a Water Ethic in the Northwest,” co-sponsored by Sierra Club and others. Stay tuned for more info. ©2013 The Globe and Mail Inc. All Rights Reserved. VANCOUVER — A growing movement on both sides of the Canada-U.S. border wants to make the restoration of salmon runs in southeast British Columbia a key issue in negotiations over the Columbia River Treaty. If the runs are revived, salmon would once again spawn in the shadows of the Rocky Mountains where they vanished nearly 70 years ago after the Grand Coulee dam was built in Washington State. “The dream of salmon restoration is alive and well,” said Gerry Nellestijn, who is a member of a citizen group appointed by the B.C. government to provide a “sounding board” for issues related to the Columbia River Treaty. Mr. Nellestijn said the opportunity to re-establish the runs arises because the treaty, an international agreement governing the management of water in the Columbia River, is up for renegotiation for the first time since it was ratified in 1964. “A lot of people don’t realize what a big opportunity this is. This is a once-in-a-lifetime chance to restore our salmon runs,” he said. Salmon were cut off from reaching Canada in the Columbia when the Grand Coulee was completed in 1942. Canada and the United States began to look at joint management of the Columbia in 1944, but didn’t get around to ratifying a treaty until 1964. Under the deal, B.C. built three dams on the upper Columbia to hold back water that is released to control floods and on demand to maximize power generation south of the U.S. border. B.C. was paid $275-million up front and receives entitlement to half of the hydroelectricity generated in the U.S. by the controlled water releases. Mr. Nellestijn, who is also the co-ordinator of the Salmo Watershed Streamkeepers Society, said the dams have caused widespread environmental damage in B.C., where river and reservoir levels fluctuate wildly. “Fish weren’t an issue when they negotiated the treaty,” Mr. Nellestijn said. He said 40- to 60-pound chinook salmon once spawned in the Salmo River, a tributary of the Columbia in the Kootenays, and other species spawned upstream in tributaries in the Rockies. John Osborn, a spokesman for the Sierra Club in Spokane, Wash., said the environmental group has written to the two U.S. federal organizations involved in the treaty, urging that “salmon and river health” be made a priority in any negotiations. Mr. Osborn said restoring salmon runs would require building fish ladders at both the 160-metre high Grand Coulee dam and the 72-metre high Chief Joseph dam, which is located just downstream. Fisheries experts would also then have to figure out how to reintroduce salmon runs that became locally extinct. “If we can put a man on the moon we can return salmon to the waters of British Columbia,” said Mr. Osborn of the challenge. In an e-mail Matt Gordon, a spokesman for the B.C. Ministry of Energy, said the provincial government is currently conducting a review of the Columbia River Treaty, as are the two U.S. agencies involved – the Bonneville Power Administration and the U.S. Army Corps of Engineers. He also said the management of salmon is a federal issue. A representative of the Department of Fisheries and Oceans was not immediately available for comment. The U.S. Entity is tasked with preparing recommendations regarding future operations of Columbia River dams with respect to power production, flood control, and as a third new purpose of the Treaty, ecosystem restoration. The Entity recently issued a set of working draft recommendations that are now circulating for public comment, and is expected to issue the next draft on September 6. The working draft recommendations are being criticized by both conservation groups and the 15 Native American Tribes that live in the Basin. Of particular concern is that the working draft over-emphasizes the status quo for hydropower production and flood control, and does not give co-equal status to environmental restoration and functioning of the Columbia River. Throughout the multi-year process, the U.S. agencies have repeatedly promised that the final round of technical analysis would inform the public about the trade-offs between different uses of the River. For example, in April 2012 at a Spokane conference, a U.S. Entity spokesman noted that stakeholder comments would be addressed in Iteration 3 of the technical analysis. Just this month, however, a consortium of 72 Columbia Basin utilities (self-styled the Treaty Power Group) urged the U.S. to “terminate” the Treaty unless an updated Treaty substantially reduces their obligations to share with Canada the surplus energy produced as a result of coordinated operation of Canadian dams (known as the Canadian Entitlement). With former BPA chief Steve Wright moving to general manager of Chelan PUD, the lead entity of the utilities consortium, and former 18-term U.S. Congressman Norm Dicks serving as their lobbyist, the utilities may be exercising substantial influence over the U.S. Entity’s decision process. The technical documents may show that coordinated operations to benefit the Columbia River ecosystem is a viable alternative to the present operational protocols, and could create new incentives for Canada to maintain the Treaty.